Recently, the new figures on the development of the population with a migration background in Germany were published by the Statistisches Bundesamt. Overall it can be stated that the proportion of people with a migrant background increased significantly between 31.12.2015 and 31.12.2016. Currently, 22.5% (= 18.6 million) of the 82.4 million people who live in Germany, have a migration background. Compared to the previous years, this corresponds to an increase of 1.5%. The largest increase was registered for people from Arab countries (+82.4%), Afghanistan (+48.1%), Iraq (+42.1%) and Bulgaria (+40.8%). However, this increase did not lead to a shift among the largest population groups with a migrant background known so far. 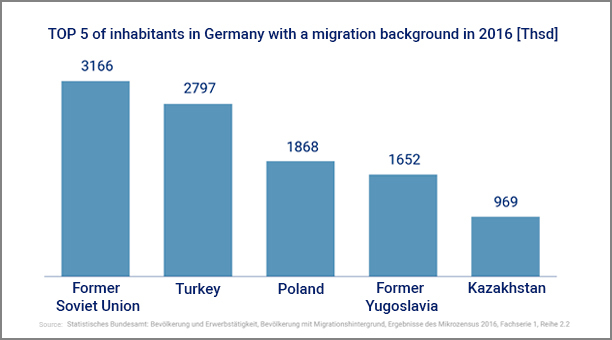 The territory of the former Soviet Union, Turkey, Poland, the territory of the former Yugoslavia and Kazakhstan still form the top 5 of the population groups with migrant background in Germany.